Old roads can live thousands of years. The Via Appia, or Appian Way, heading south from Rome, was built 2000 years ago. It is still is trod and even driven in parts. Portland has its own roads—ancient by our standards-- that are still in use. SE Stark Street was platted in the 1850s; it was then called Baseline Road, running along an east-west baseline (the Willamette Baseline) that, along with the north-south Willamette Meridian formed the basis for mapping and measuring all real property in Oregon and Washington. The legal description on your home’s deed or mortgage describes where your property lies in relation to these two lines. The baseline and meridian were mapped in 1851. 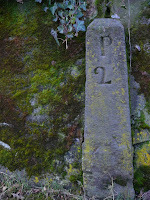 They cross in Portland in the West Hills at Willamette Stone State Park. For a steep walk up to the Willamette Stone State Park, see this link to a tough climb through forest and neighborhoods, with a killer stair climb to boot. Stark was the main route into town from the east; along its length you can still find old stone mile markers (P2, P4) that indicate the number of miles from “P”—Portland’s Multnomah County Courthouse, according to http://starkstreetmarkers.blogspot.com/. The Courthouse, now known as the Pioneer Courthouse was built between 1869 and 1875. The stones, it is thought, date from the 1870s. A fellow lover of Portland trivia has created a great little blog about them. The Stark Street Ferry was the final leg that brought travelers in to Portland. In the 1850s, it was just a few blocks along the Willamette. It was on the ferry landing in 1858 that Danford Balch shot his brand-new son-in-law, Mortimer Stump, because he had eloped with Anna Balch. Danford fled the scene, hid out in the woods along Balch Creek (now Forest Park) and was caught and hanged in 1859 at the site of today’s Salmon Street Springs. Balch Creek is named for him; he and his wife and children homesteaded along it. Sandy Boulevard is another ancient-by-local-standards road. It dates from the mid 1850 s and was laid out as a market road into Portland, used by farmers along the rich Columbia River bottomlands. Its diagonal line cuts across the grid of streets that was later imposed over what is now Northeast Portland. Old can also be near-forgotten, at least by most travelers. Some of my favorite roads are “Olds”—Old Germantown, Old Cornelius Pass, Old Highway 47. They aren’t nearly as tidily straight as their newer versions. They hug the land higher up the hillsides, they have steeper grades, and less traffic. They’re not as built up or wide, and on them, your car or your bike returns to a less frenetic pace, where the journey is just as interesting as the destination.